Photo: Community Park Angels� Liam Fox sets to throw as East Park A�s Kevin Olafson slides into third during Saturday�s action. With the Canadian Little League Championships only six weeks away, one Edmonton team started its road to the nationals, as the host-selection tournament took to the field at John Fry Park on Saturday. 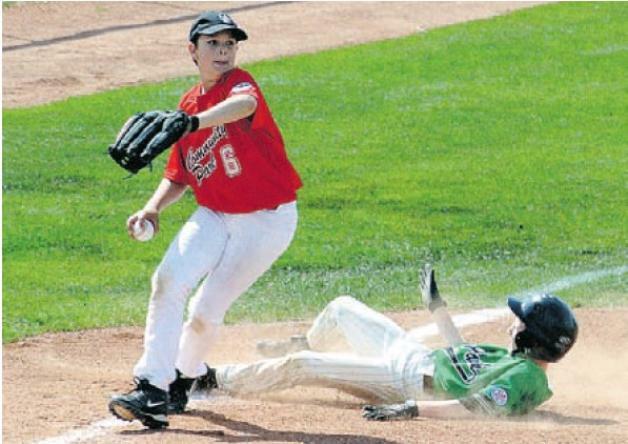 Teams from Community Park, Confederation Park, East Park and Mill Woods little leagues are all looking for the chance to represent the City of Champions as the host team at the upcoming Canadian championships, which runs Aug. 4-11. Saturday was a fitting way for the organizing committee to start the home stretch to the national tournament, as Mill Woods earned a 12-5 win over Confederation, and East Park topped Community Park 8-2 on a gorgeous day for baseball. The round-robin tournament to find Edmonton�s second-ever host team � the city hosted the event only once prior in 1989, when Confederation lost to High Park from Toronto in the final � runs until Thursday, when one team will secure the first of six berths from across the country at the national event. For longtime little-league volunteer and Canadian championships committee member Gerry Dawidowski, Saturday marked a step closer to a goal that�s been years in the making. �It�s the dress rehearsal for the big show,� Dawidowski said of the host tournament. �we�re going to see the team that�s going to emerge as the host team for the tournament, which is really exciting. For Dawidowski, the idea to host the national little-league event � which will send one team to Williamsport, Penn., to represent Canada at the Little League World Series in August � was something first floated by host tournament director Wayne Sperling. While Dawidowski and company may not have envisioned the bid coming to fruition and eventually beating out the likes of Calgary, the event is coming into focus. �It�s been a slow process of getting people in place and figuring out what we need. As with anything there were some changes at the top. One of the big changes was that Kevin died of cancer. That was a big loss, then Howard Davidson took over for a while, then he stepped down and now Wendy Berdahl is in charge,� Dawidowski said. While sponsors and the city � which worked with the host committee to build the new little-league-specific field at John Fry Park � have played major roles in making sure the event is a success, it�s the volunteers that are the backbone of the entire endeavour. �I don�t think any of the volunteers for 2012, maybe one or two, still have kids playing,� Dawidowski said. While there were plenty of smiles and excitement to go around Saturday as the host tournament opened up, those emotions were tempered in large part because of the recent loss of longtime little-league supporter Glen Gregory. Gregory, who started volunteering for little league in 1974, passed away earlier this week after suffering a heart attack, and was honoured with a moment of silence before Confederation�s game Saturday afternoon. Gregory was heavily involved in the Edmonton baseball scene for decades and was well known to players, parents and volunteers alike for his passion for the game and for devoting countless volunteer hours to Confederation Park. �He was always involved with not only Confederation Park, but the district as a whole,� Dawidowski said. �He was in charge of a lot of different parts of what�s going on.